Meet the makers of the Detroit-New York art pipeline. When Paulina Petkoski and Samantha Banks Schefman went on TV, they brought one of their artists with them. While they spoke, he painted. It was a crafty way to share Detroit art with the world. Paulina and Sam's mission is to do just that. It's an important one because, as Paulina implies in the clip, in Detroit art isn't just art. It also stands for hope. Art has, time and again, signaled the recovery of urban landscapes all over the country, and Detroit hopes to be no exception. One such landscape is Brooklyn, the pole on the other side of the cultural pipeline that Paulina and Sam have set up to get their artists the attention they deserve. The engine of that pipeline is PLAYGROUND DETROIT, not only a multi-purpose Detroit gallery, event creator, and culture maker, but an essential link between Detroit artists and those with the resources to make their careers. After years of successfully operating guerrilla-style (PLAYGROUND DETROIT produced an incredible event for Breakout on our trip two years ago), Paulina and Sam are finally making things official with a brick and mortar space opening Spring 2017. To fundraise for their new space, the dynamic duo are bringing some Detroit art and music to Pete's Candy Shop in Brooklyn this Sunday at 3pm. You are at the forefront of cool, but not without controversy. Have you received any backlash about gentrification? Sam: We're good at working with the community and being sensitive to what has really been historically a serious racial divide. 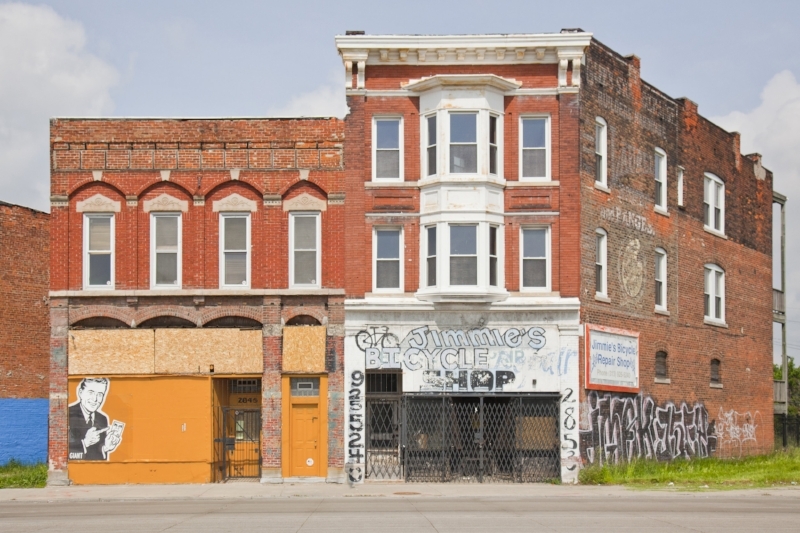 Detroit, especially with Mayor Duggan as leader, has really been sure to face gentrification concerns head on. Paulina: There is a lot of diversity within the creative community here. We work with a group of talented individuals that coincidentally includes a lot of female artists. There's a lot of cohesion between gay, straight, black, white. I think it's a pretty great community to be a part of, and we try to reflect that as best as possible. So are you a gallery, in the traditional sense? Sam: Yes. That's definitely one facet. The space that we're opening is a gallery and retail storefront. The retail side of things will be very design-focused art objects. That ranges from furniture and clothing to household goods and books. We hope that for the most part, the gallery work will showcase Detroit-based creatives, but that a lot of the design will be our opportunity to bring in creators from all over the country, especially New York and LA, and really bridge those communities. Tell me more about the new space. Where is it? Sam: We're moving into a neighborhood that was an old restaurant supply district, and it's not gentrified in any way shape or form yet. We want this space to really be open to our neighbors. We don't want anybody to feel like they're not welcome or that we're not interested in integrating. We have a really large yard. I think that's going to be an opportunity for us to create a community space without boundaries that's also safe and inspiring. Paulina: It sits between Eastern Market and West Village. It's on Gratiot Avenue just past the Dequindre cut. How did you develop your nose for good artists? Paulina: Art is always subjective, but there's a few things that generally guide what we do. You've got to be in the community. You've got to be seeing someone's determination and drive. I always say that we like to work with people who are going 100%, 110%, and that we can push them even further. That's why we have an artists' residency program for artists that are not as established, to give them some of the skills on how to set up an exhibition, how to price their work. Then there's also a taste that's personal to Samantha and I. We both have different tastes, but we both worked in the fashion industry. I think that’s an influence on both of us. How would you describe the difference in your individual tastes? Paulina: Sam’s dad is a fine artist and she grew up in galleries, so I think she’s more, I wouldn't say traditional, but more within the art world. My personal taste is contemporary and vibrant, a lot of new media. Sam: I'm not sure in terms of art, I don't think our tastes differ too far. I think it's just more that when we’re finding new artists we start in different places. I'm more connected with Cranbrook and Paulina is probably more connected with younger people. I think it's just more a difference of who we're around, rather than what our taste is. Paulina: Yeah. I think we're always agreeing on what we're presenting. I don't think there's ever been something that we’ve presented that we didn't agree on. Sam, is your father an artist I would know? Sam: Probably not. He's mostly known in Michigan and shown in this really great museum in Ohio and Indiana. Most people know him here because he's been head of one of the departments at the College for Curative Studies for ten years. He does realism, which is sort of coming back around again in the art world. His name is Robert Schefman. He'll get there one day. I know you also work with musicians. You brought an incredible one to the Breakout event you created a couple of years ago. That was unforgettable. Paulina: Tunde Olaniran! Yeah He is going to be at South by Southwest this year. He's a breakout artist, pun intended, that we've actually supported since 2012. We brought him out to Union Pool in New York for a show and paired him up with a few New York artist-musicians. Once you make it in Detroit that's great, but we want to push you to New York. We recently helped an artist who's extremely talented here and very well known, Ellen Rutt, do a 3-D mural in the Wythe Hotel in Brooklyn. We're so proud of him. It's like you guys got such a special experience because we really were able to break that artist to your whole audience in such an intimate way. That’s really defining of us. The impression I'm getting, and please tell me if I'm wrong, is that you guys are connectors. You’re connecting great art to patrons or people who need it? Paulina: Yeah. You know what? You're absolutely right. A few days ago, one of our artists, Ouizi, said, " You guys are a conduit for all of this creative energy." It's not just that we connect the great artists to the audience and the patrons, but we connect them to each other. Conduit, I like that word better than connector too because connector can refer to something else. I love that. Would you guys say that you're like a Detroit-to-New York art conduit? Paulina: Yeah. Culture conduit could be appropriate. Actually, this would could be cool for your audience to know, we started a Facebook group that you can request to join. It's actually a Detroit-New York ride share group. If someone is driving out from New York or Detroit you can post and say "Hey, does anyone come out with us?" I've got extra gas" or "I'm leaving this date." Wow. So you're a physical conduit as well! Paulina: We've done it a lot. When I moved back from New York, I got the biggest U-Haul I could find and picked it up from somewhere in New Jersey. Drove it to my storage unit in Greenpoint and loaded up the entire thing by myself, all of my belongings that I had, and drove back to Detroit with everything. I only stopped once. I've never done that before. I was terrified, with all of my belongings, and it was such a big truck that I just wanted to get back here as fast as I could. That was really empowering for me to be able to figure that out, make the commitment and make the move all alone. We arranged and hosted a tour two years ago where we loaded up a psychedelic RV named Harvey the RV. It lives in Bushwick. We brought 14 creative professionals from New York to Detroit for a weekend during the Detroit Design Festival. We gave them a 72-hour immersive experience and literally drove overnight. We left New York Friday evening. We got in to Detroit Saturday morning in Eastern Market and then we just kept them going. We put them up at Hostel Detroit. It was kind of a Breakout experience just on a smaller scale. What's that road between New York and Detroit like? Any highlights? Sam: Pennsylvania is rather long and boring but it's beautiful and depending on how fast you go, it's about 10 to 12 hours. There's a place in Pennsylvania called Dutch Pantry. It just happens that it's about midpoint if you want to stop and eat. It's probably one of the better restaurants. It's like home cooking. Sam: It's like it's a theme and pool park. It’s pretty creepy. Paulina: But it doesn't say that off the freeway. You don't know what it is. It just says "Exit to Make Believe Land."